The icon of fuel tank at the lower left stands for the HP of your warplane. The yellow bar is the CD time of tumble! If HP is 0 the game is over. Use tumble to avoid crash and bullets. The controller of the bomb on the bottom of screen. When it shows MAX, you can tap it to call bomb! Please use it in emergencies. The button at lower right corner is your special skill. The stamina of your warplane will reduce after each battle! So you should pay attention to the stamina loss often. Repair them if needed to restore stamina to 100%. I personally pick the tornado warplane, it has a high aircraft gun and powerful special skill. Basically you can survive any levels when you have a high attack damage rate. The more you destroy enemies warplane,the higher your chance to get power ups such as fuel. 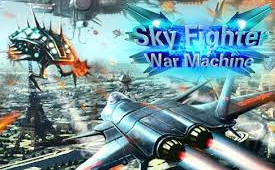 So upgrade your "Aircraft Gun" to easily kill enemies and bosses. Tornado's special skill is your weapon for boss. It can kill bosses very fast compared to other special skill.